Last autumn I discovered that it was possible to make an “instant” steamed pudding in the microwave which cooked in a matter of minutes. It is a perfect short cut; especially if your kitchen does not have an extractor fan to get rid of the clouds of steam, and 3 or 4 minutes of microwave time is going to cost far less in energy than an hour on the hob, an important consideration these days. I wanted to make a zesty pudding for spring so used a combination of lemon and cardamon, being egg and diary free this pudding is also chlorestrol free, making cream an almost guilt free addition (this being the same logic that allows a pizza after the gym!). The addition of the carrot adds extra sweetness and colour and by contributing to one of your 5 a day adds to the guilt free aspect of the pudding! 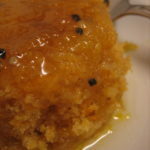 If you try this (Almost) Instant Steamed Lemon & Cardamon Pudding please tag #FussFreeFlavours on Instagram or Twitter. It is amazing for me when for me when you make one of my recipes and I really do love to see them. You can also share it on my Facebook page. Please pin this recipe to Pinterest too! Thanks for reading Fuss Free Flavours! 1 medium carrot finely grated. 6 cardamon pods - lightly crush - discard the outside and crush the black seeds. Lightly crush the cardamon pods and remove the seeds, discard the cases. Zest the lemon, then cut into quarters (you can juice it but boiliong the leomon quarters in the sugar syrup will extract all the flavour and save you the time of squeezing the lemon and then washing the squeezer). Add to a saucepan along with the cardamon seeds and sugar, add 1/3pt water, bring to the boil and simmer for about 15 mins. Cool, squeeze the lemon rinds and discard. Whilst the sauce is simmering prepare the pudding. Place the wet ingredients into a jug and whisk. Place the dry ingredients into a basin, mix well, pour the wet into the dry and stir well until you have a smooth batter with no lumps. 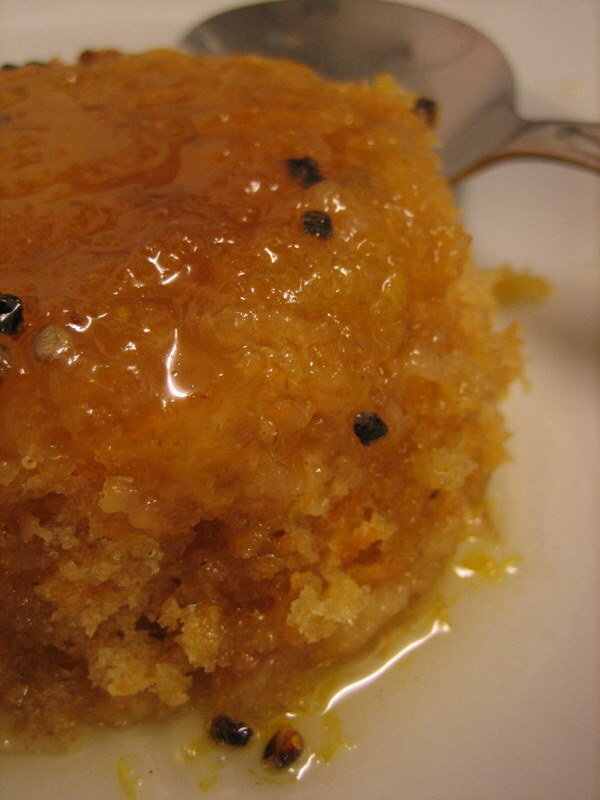 Grease a pudding basin, add half the lemon syrup, carefully pour the batter over, making sure the syrup is covered. Cover with cling film and pierce once or twice. Then microwave on full power until done It took 4 mins in mine, but as all microwaves are different cook in 1 min bursts until it it risen (I use a galss basin so I can see the pudding rise as it cooks) and a cocktail stick inserted into the middle comes out clean. When cooked let it stand for a min or two. Run a knife round the base, put a plate over the bowl and flip. the pudding should turn our, pour the rest of the syrup over and serve immediately. Note: I adore cardamon and this pudding does taste strongly of it, so you may want to use slightly less than I have. *Fuss Free Tip: Freeze any left over lemon juice in an ice cube tray, each lemon cubeis perfect for adding to baking or for salad dressings.